Bright balloons bob above a sea of rainbow-colored signs as loudspeakers blare music and announcements, and people in hats and shirts emblazoned with slogans hand out fliers, stickers and buttons. Election Day in the United States often arrives dressed as a carnival, ready to attract attention and excite voter interest. The day begins early on the Tuesday after the first Monday in November in villages, towns and cities across the United States, as thousands of volunteers rise before dawn to lend a hand during the elections. Some will line up outside campaign headquarters, eager to pick up the flyers, pamphlets and signs they will distribute at polling places in the hope of still influencing voters’ decisions. A campaign worker’s involvement might have started with a newspaper article, a call for help from a community group or labor union, or a chance meeting with a prospective candidate. It might have been an issue about which he or she felt passionately that prompted a voter to give a candidate more than just a vote on Election Day. Whatever their initial reason for getting involved, these workers, most of them unpaid, lend their time and expertise to inform, educate and encourage their fellow voters to support specific candidates, political parties or issues. • “Lit drops” involve distributing by hand printed "literature" about a candidate to voters’ homes, with volunteers assigned a specific area. • “Mailers” are pieces of written information sent to voters’ homes, but volunteers prepare the material — folding letters and stuffing, stamping and addressing envelopes. Months in advance of the election, volunteers start distributing signs for voters to place in their windows or yards and handing out information at bus and subway stops. They attend rallies and fundraising events, wear T-shirts with campaign slogans and display flags and bumper stickers on their cars — all to demonstrate support for the candidates of their choice. 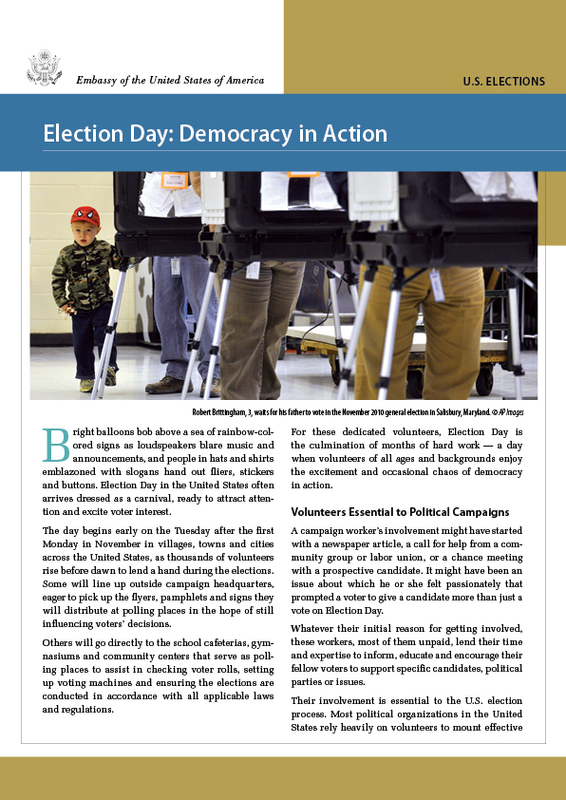 On Election Day, volunteers distribute campaign and voter information at polling places and serve as their parties’ witnesses to the legal action of voting. A long day’s work (sometimes more than 12 hours at the polls) is capped by an anxious wait at a “victory” party for news of whether their candidate won or lost the election. Many volunteers working on Election Day take a deliberately nonpartisan approach and work to educate rather than influence voters. Members of the League of Women Voters, a nonpartisan political organization established in 1920, are dedicated to improving government and enhancing public policy through citizen education. The organization describes itself as “a grassroots organization, working at the national, state and local levels” throughout the United States and its territories. Nonpartisan means it neither supports nor opposes candidates for office at any level of government and acts as a respected neutral party in political events such as candidate debates. Some of its members also serve as election officials. Every polling place in the United States relies on election officials to ensure fair, orderly voting, protect the rights of voters, and enforce voting laws and regulations. Requirements for serving as an election official vary from state to state, but all require officials to be registered voters. States also prohibit candidates seeking office, as well as members of the candidates’ families, from serving as election officials. Election officials must undergo training before Election Day to become familiar with both the procedures and the machinery for voting. They learn how to assist voters without influencing, interfering with, or intruding on the right to vote freely and secretly. Above all, election officials must be impartial. They cannot promote a specific candidate and cannot wear or display any items that advertise a candidate or a political party. By the Wednesday after the election, the streamers will be down, the signs removed and all the related trappings of a spirited campaign season packed away, as the volunteers return to their usual routines and their newly elected leaders get ready for the business of governing. And, in offices scattered across the nation, the planning will begin for the next Election Day. Most political organizations in the US states rely heavily on volunteers to mount effective campaigns, and both parties actively recruit volunteers on national, state and local levels.